If you like cooking, you need a functional tool. This applies to both women and men and starts with the knife. The ergonomically shaped handle of the SIZE S series - available in red (plastic) and olive wood - nestles perfectly into the palm of the hand and guides the hand when cutting. The blade made of X50 CrMoV15 blade steel is forged in one piece in the die. It is vacuum- and ice-hardened and thus has a fine, dense and homogeneous structure, which guarantees lasting edge retention and corrosion resistance. 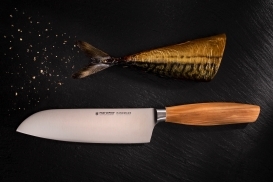 SIZE S gives the preparation of food lightness and lasting pleasure when working with functional and exceptionally beautiful tools. SIZE S OLIVE Santoku knife 6,5"
SIZE S OLIVE Paring knife 4,5"
SIZE S OLIVE Steak knife 4,5"
SIZE S OLIVE Chef's knife 8"
SIZE S OLIVE Turning knife 2,5"
SIZE S OLIVE Chef's knife 7"
SIZE S OLIVE Universal Knife 6"
SIZE S OLIVE Bread knife 8,5"
SIZE S OLIVE Meat fork 6,5"
SIZE S OLIVE Meat-and carving knife 8"
SIZE S OLIVE Paring knife 3,5"